Christmas party season is in full swing. Knowing that I had my work Christmas party on Friday evening, I bought all of the neccessary food supplies for the weekend on Thursday evening after work. And I’m so glad I did. I have a huge amount of eggs in the house at the moment so thought of ways to use them up. One idea was eggy bread, something that my mum used to make me every weekend when I was younger. I adored it but for some reason I’ve never made since I flew the nest. It is best made with brioche but I used granary bread and it was still delicious. 4. Place two slices on each plate. 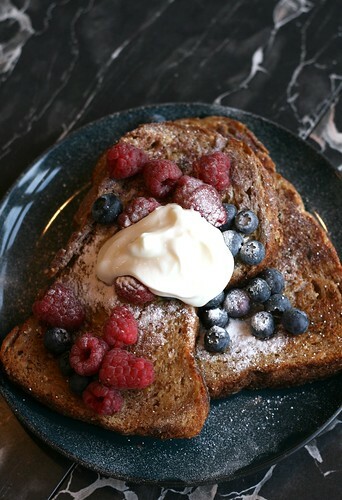 Place a handful of berries, a tbsp of crème fraîche, a dusting of icing sugar and a drizzle of maple syrup on top. Yum, Panettone – I really want to make that but have never got around to it! Do you have a recipe? Your chocolate chestnut truffle cake also looks fabulous!